A stroller packed with loads of necessary features for both mama and tot with a super reasonable price can be found in the Contours® Options® 3-Wheeler Stroller. When I pulled it out of the box it was pretty large (almost 28 lbs total) and took some time to assemble. I started and Hubs took over...so sweet! The instructions were pretty clear and we were ready to roll within 20 minutes. Mason uses the Maxi Cosi Mico carseat and it fit right on top of the Contours adapter. The strap is placed over the carseat and you are ready to roll. You can see from the photos that the storage basket is easily accessible when using the infant carseat. The space is HUGE and you can easily fit a diaper bag, blanket, snack bag, shopping bags, etc. It was Kenzie's turn (as usual) to take a ride in the Contours Options stroller. The seat is lightweight and reversible. It can be changed by an easily push of the buttons on either side of the frame. It's so easy that I can even change the direction with Kenzie sitting in the seat since she's only around 26 pounds. I do have to note that when parent facing, it seems that your baby is far away. However, it allows for easier handling once your child becomes a toddler. One of my favorite features of the Contours Options stroller is the parent tray with its deep cup holders (two) and middle area for storing phone, snacks, etc. This is sturdy and super convenient because each parent can have a drink or you can even put a baby bottle on one side. I wish the middle area had some sort of cover (in case you wanted to store money) but it's not a breaking point. I wanted to note that there is also a cupholder that fits on the seat so your little one can have their bottle/cup right within their reach. Our cup holder was so popular out of the box that it is currently being used in Kenzie's playhouse. I need to take it back while she isn't looking. Let's discuss one of the most important features of a good stroller - the ride. There are 12" rear never-flat wheels and the 8" front single-swivel wheel. The stroller handles pavement, grass, gravel and dirt pretty well. Kenzie and Mason both are comfortable and enjoy the ride without any complaint or crying. Major plus! This stroller can easily move through crowds in shopping plazas as well as doorways. It also folds easily by lifting up on the trigger on the sidebar and the upright stand is fantastic. Your stroller stays clean (a major annoyance I have when the canopy gets dirty from the ground). If you want a stroller that can be used from birth to 50 lbs and packed full of must have functions with a price easy on your wallet, pick up the Contours Options 3 Wheeler Stroller and you or your gift recipient won't be disappointed. Buy It: You can purchase the Contours Options 3-Wheeler Stroller for $169.99. Make sure to connect with Contours on Facebook and Twitter! The cup holder is a huge plus as cups and bottles would always get lost or end up under the child and leak. I've been looking for a stroller that will hold a car seat, is easily maneuverable, and won't break the bank. This one definitely fits the bill- plus I love all the little "high-end" extras. Thanks for sharing! oh love that it is up to 50 lbs and has a smooth ride and never flat wheels! love that it holds diff types of car seat!! That is the best! its secured onto the stroller! and economically priced! This looks like a great compact stroller and for a great price. I really love that is hold the car seat and you can compact it down so easily. Thanks so much for sharing this information. This stroller looks great! I love the big durable wheels that will create a smooth ride! Great stroller. 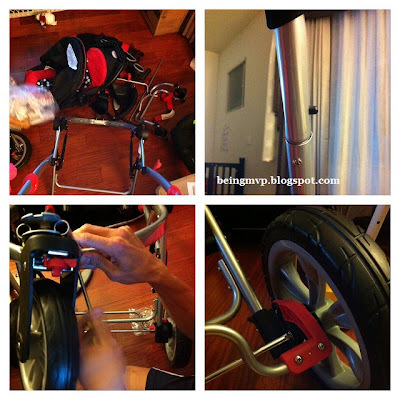 The stroller looks durable and very easy to work with. I have the pink version of this stroller and I love it. It is so easy to push, so easy to fold, its cute, and I get lots of compliments. 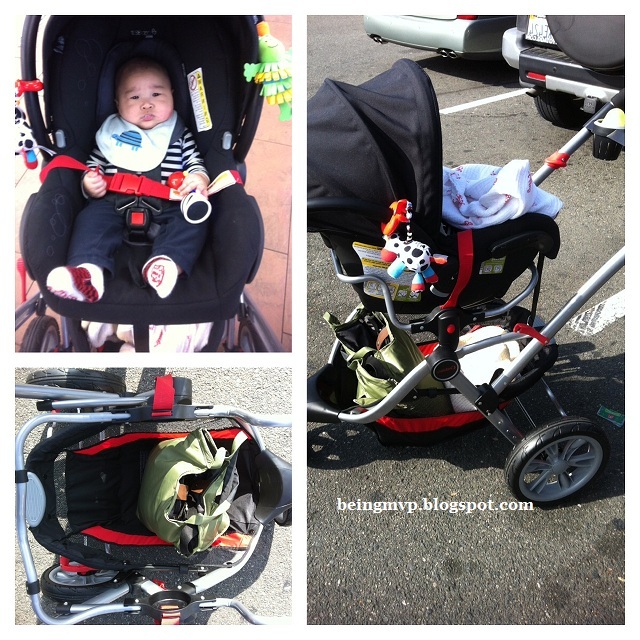 I love this Contours stroller! I'm trying to convince hubby that we definitely need this stroller! This Contours stroller looks so lightweight. The hardest part of having a stroller is folding and packing in the car, etc. This looks easy. This is one awesome stroller! It has great room for the child and yet will fold right up to fit in the trunk with such ease. Thanks for sharing. Compact stroller and for a great price! love the way that it compacts down so easily and you can do it with one hand. Thanks for sharing. love how diverse the car seat choices are! Plus the tray holder (complete with places to put drinks!) is awesome! This looks like a really versatile stroller. I am going to recommend this to my sister who is expecting her first in the spring. great looking stroller. looks like its easy to maneuver.